Alduin, or the World-Eater, as he is known to the residents of Skyrim, is an immensely powerful dragon. He is depicted as a malevolent force who destroys the world periodically, and the Nords believe that his reappearance heralds the end of time. He is the self-proclaimed First-Born of Akatosh and aspect of Akatosh ("Do not forget that it was Heaven itself that shed you from me."). [UOL 1] His name can be separated into "Al Du In", which means "Destroyer Devour Master". 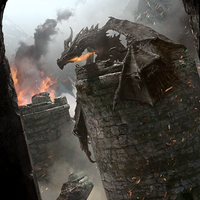 According to Paarthurnax, Alduin's younger sibling and chief lieutenant for much of the ancient Dragon War, Alduin was once considered the greatest of Akatosh's creations. According to the writings of Archmage Shalidor, dragons had existed since the advent of time, but were initially as wild as anything else. It was Alduin who created their civilization. One legend says that Alduin can "eat" away the age of his victims, and that his ghost once ate the entire Nord population down to age six after being summoned by Orkey. This legend is somewhat grounded in reality, as Alduin feeds on the souls of the dead in Sovngarde, a privilege he guards jealously. Imperial scholars concluded that Alduin is not the chief of the Nordic pantheon (in fact, that pantheon has no current chief since Shor), but thought he was its wellspring, albeit a grim and frightening one. Many Nords insisted that the belief he is some sort of Nordic version of the God of Time is a false one perpetuated by foreigners who misunderstood, or underestimated, Nordic oral traditions. Alduin grew proud and chose to forsake his proper role as World-Eater in favor of conquering Mundus for himself and his fellow dragons. It was Alduin's claims of godhood that convinced Paarthurnax to lead some other dragons in rebellion, and he turned to the ancient Nords for allies. Paarthurnax instructed several of them on how to use the thu'um, which they used to bring about Alduin's defeat by flinging him forward in time. Groups such as the Dragonguard and Greybeards made sure to preserve his legend so the people of the future would remain wary. In 4E 201, Alduin reappeared near the Throat of the World, from where he had been banished thousands of years before, and decimated the town of Helgen. The resulting escape of Ulfric Stormcloak prolonged the civil war in Skyrim and secured for Alduin a steady flow of souls to be consumed in Sovngarde. As the World Eater set about resurrecting dragons loyal to him, the Last Dragonborn was revealed and sought to stop him. Though this Dovahkiin took the souls of many of Alduin's soldiers, their leader proved impervious to death in the Mundus. Eventually, the Dovahkiin gained access to Sovngarde and finally vanquished the wyrm. Alduin's soul was not absorbed by the Dragonborn, and he may not have been completely destroyed. It is possible that Alduin will one day return to fulfill his role as World-Eater. ^ a b c d e Paarthurnax's dialogue with the Dragonborn. ^ a b c d e f g h Events of Skyrim. This page was last modified on 22 January 2019, at 18:20.